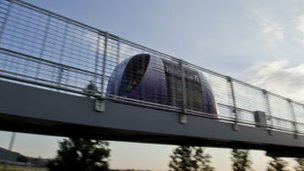 Automated pods on a guided roadway may be used to transport workers around a multimillion-pound enterprise zone in Bristol. The city council is considering the plan for the business park close to Bristol Temple Meads station. Liberal Democrat transport councillor Tim Kent said the pods were one of many options under consideration. “It’s a lot cheaper than a traditional tram and it’s good for an area as small as the enterprise zone,” he added.